Never miss a beat with this stylish and amazingly accurate metronome: it balances the functionality you need with the precision you expect, all in an intuitive interface that's designed to get you playing as quickly as possible. 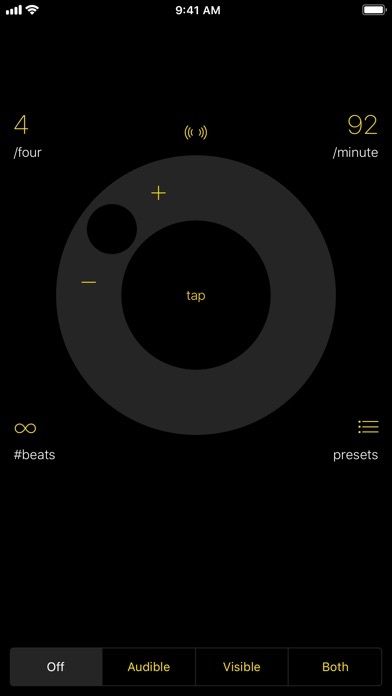 Introducing Beat Keeper, from the creators of forScore. Use audible mode for a more traditional experience, use visual mode to see the timing instead, or use both for even more flexibility. Set the tempo by typing it in, using the adjustment dial, or by tapping twice in the center of the screen. Create and switch between as many presets as you like for quick access to your most frequently-used settings. Beat Keeper lets you work with your other apps, supporting both Split View and Slide Over on the iPad, and it uses multitasking to continue playing even when it's not on screen. It also works when your device is in silent mode so you can avoid interruptions. Plain, simple, and spot on every time.